The Wright brothers were from Ohio, but they achieved most of their successes in North Carolina. Do you know why they decided to do their flying experiments there? To find a better location for their pioneering aeronautical (aircraft) experiments than their home in Dayton, Ohio, Orville and Wilbur Wright consulted the U.S. Weather Bureau. 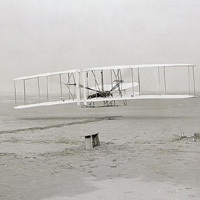 The brothers found that the town of Kitty Hawk, North Carolina, offered the sand dunes and high winds that they hoped would help them in their attempts at powered flight. The Wrights spent months in North Carolina working toward their goal. On December 17, 1903, they finally succeeded. Orville flew the powered glider first, then Wilbur, then each once more. The brothers had achieved the first powered, controlled, sustained flight of a heavier-than-air machine.